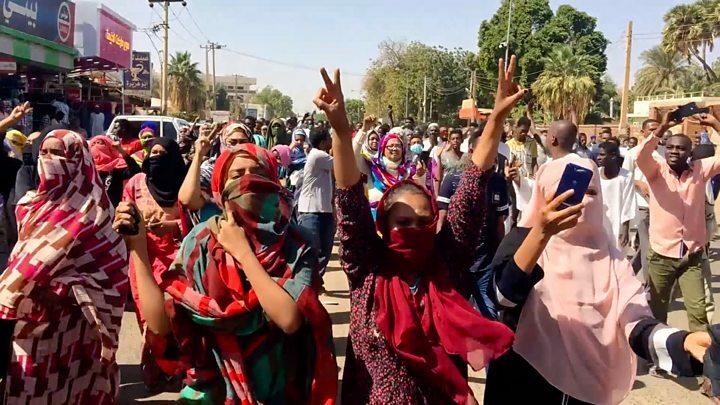 Home / World / Sudan crisis: protest leaders call for the end of the "deep state"
Sudan mass protests organizers have told the BBC that they want to completely dismantle the "deep state" left by the state of Omar al-Bashir. Mr. Bashir was overthrown by the army last week after he had been in power for 30 years, and a military council has pledged elections in two years. 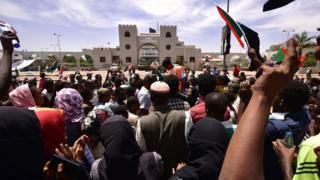 However, the demonstrators remain outside the army army center in Khartoum and demand a civilian administration. According to reports on Monday, there were efforts to break the sit-in. Details are unclear, but witnesses said the troops had withdrawn from the immediate confrontation. On Sunday, the military council tried to appease the protesters and told them that key figures from the former government had been arrested. It is not clear who these officials are. A military spokesman also pledged not to disperse the demonstrators, saying that the council was "ready to implement the civilian government agreed by the opposition parties." 3 people were reported killed in an armed attack on demonstrators in the troubled South Darfur region over the weekend. The privately owned website for Darfur 24 said "armed men" attacked the protest against the government in a camp for displaced persons about 17 km (10 miles east of the capital Nyala. Mr. Bashir has been charged by the International Criminal Court for war crimes and crimes against humanity in Darfur. He denies any wrongdoing. What are the protest leaders demanding? Amjad Farid of the Sudanese Professional Association (SPA), which has led protests, told the BBC that they had "completely rejected" the military council currently in Sudan. He said demands included the "complete dissolution of the deep state" and the dismantling of state intelligence. Opposition politician Mubarak al Fadil told the BBC that the role of the military would decline over time. Media Playback is not supported on your device. Media Caption Sudan Protests: So, what's going on? "There could be two transition periods," he said. "A first transitional period that lasted six months, in which will remain the Military Transitional Council of the Sovereign [power] and will perform a series of important tasks and tasks required to clear the soil, and then the remainder of the transitional period – which is a year and a half is – could be headed by a Presidential Council with military representation. " Meanwhile, protesters in Khartoum remained in a defiant mood. Overall system, a system that does not serve humans alike, "said Mohammed Jakur to AFP," a system that [s] leaves people in poverty. A system that does not allow Sudan, as a rich country with human and natural resources, to trade like any other country in the world. " What did the military say? At a press conference on Sunday, spokesman Maj Gen Shams said Ad din Shanto, the military council is "ready to implement the civilian government agreed by the opposition parties." "We will not appoint a prime minister, I will choose one," he said. He also said that the army would not forcefully remove demonstrators from their seats, but called on crowds to "resume normal life" and stop unauthorized roadblocks. "The lifting of the weapons is not tolerated". he added. A review of diplomatic missions and the deposition of Sudanese ambassadors to the United States and the United Nations in Geneva  What is the background? Protests started in December because of a steep rise in the cost of living, but soon developed into a broader call for the removal of Mr. Bashir and his government. Then last Thursday, the military removed and imprisoned the veteran leader in power after almost 30 years. Putsch leader Defense Minister Awad Ibn Auf announced that the military would oversee a two-year transitional period followed by elections. Month of the state of emergency. But demonstrators vowed to stay on the streets unless they immediately switch to civilian rule. Mr. Ibn Auf himself resigned the next day, as did the dreaded security chief Gen Salah Gosh. General Abdel Fattah Abdelrahman Burhan was then appointed Chief of the Transitional Military Council and became the third leader of Sudan in many days. Mr. Bashir's whereabouts are unknown, but the military said he was in a safe place. The military council has said he will not extradite him to indictment before the International Criminal Court, although he may well be tried in Sudan.